Take Current Affairs quiz February 6, 2019 to enhance your General Awareness. Practice with our esteemed Current Affairs quiz February 6, 2019 questions which covers all important events across India as well as World. Make use of all important Current Affairs quiz February 6, 2019 questions with answers updated here, at free of cost to succeed in all competitive Exams and Interviews. With which Country did the Indian Union Ministry of Coal sign MoU on cooperation in the field of coal mining? The Union Ministry of Coal on February 4, 2019, signed a Memorandum of Understanding with Ministry of Energy, the Republic of Poland in New Delhi on cooperation in the field of coal mining. On which State did the National Green Tribunal (NGT) impose a penalty of Rs.25 lakh for polluting Upper Ganga Canal? The National Green Tribunal (NGT) imposed a cost of Rs.25 lakh on the Uttar Pradesh government for failing to stop dumping of sewage and untreated water in the Upper Ganga Canal. Where is the Sanjay Gandhi National park located? Sanjay Gandhi National park located in Mumbai Maharashtra. Ministry of Environment approved India's 1st bullet trains to pass via ________ park. A committee, chaired by Union Environment Minister Harsh Vardhan, approved wildlife clearance to the Mumbai-Ahmedabad fast bullet train corridor that encroaches upon a Thane Creek Flamingo Sanctuary and the Sanjay Gandhi National Park, the home to leopards, in Mumbai. Who Acquihires Bengaluru-Based AI Startup Kint? Swiggy acquihires Bengaluru-Based AI Startup Kint. Kala Ghoda Festival 2019 Begins in --------? Kala Ghoda Festival 2019 Begins in Mumbai. Which article from Indian Constitution will invoke President's rule on the State? President's rule is the suspension of state government and imposition of direct Central Government rule in a state. It is Under Article 356 of the Constitution of India. After which scam did the Bengal State demand for the President's rule in the State? The Scam that took place in West Bengal is the Saradha chit fund scam. West Bengal's Saradha scam is about _______. Which union minister inaugurated 30th National Road Safety Week in New Delhi along with Shri Nitin Gadkari ? Union Minister Smt Sushma Swaraj inaugurated 30th National Road Safety Week in New Delhi along with Shri Nitin Gadkari. World heritage centre to be set up at Mayapur in West Bengal. World heritage centre to be set up at Mayapur in ---------? Who is the defence Minister of Russia? Sergei Shoigu is the Minister of Defence of the Russian Federation. Which Country announced that it is to created land-based long-range hypersonic and cruise missiles during 2019-2020? Russia’s Defence Minister Sergei Shoigu announced that the country is to make land-based long-range hypersonic and cruise missiles during 2019-2020. Which ministry launched Shehri Samridhi Utsav? Ministry of Housing and Urban Poverty Alleviation launched Shehri Samridhi Utsav. Which year Mines act was passed by union government ? Union Government passed Mines Act in the year 1952. Are you looking for right place to enhance your Knowledge on Current Affairs of 6th February 2019 through effective Quiz section? 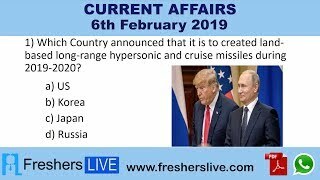 FreshersLive grants you the advantageous Current Affairs Quiz questions with accurate answers for 6th February 2019 which covers all the important events, supreme Awards, major occurrences in the National as well as World level. All important Current Affairs Quiz questions of 6th February 2019 are updated instantly in this page. Everyday at least 25+ Current Affairs Quiz Questions are displayed in this FreshersLive page. Correct Answer for each quiz question is given at the end of the entire 6th February 2019 Current Affairs Quiz questions section. You can estimate and upgrade your GK by attending these useful quiz questions. Entire quiz questions of 6th February 2019 Current Affairs covers Competitive Exam as well as Interview point of essentially important topics like International News, National News (ie. Indian Affairs), Science & Technology News, Environmental News, Bills & Acts Passed by Government, Defence News, About important Persons, Places, Banking & Economical News, Awards & Honours, Sports News, Revolutionary Updates on Arts & Culture, Obituary, Summits & Conference, Important Committee, Schemes, Appointments, Important Days & its Theme for Current as well as upcoming Year, Books & Its Authors, Agreements & MoUs, Budget, Taxes, Various Important Lists & Indexes, Visits by World Presidents, Prime Ministers, Political affairs and all Current Events. 6th February 2019 Current Affairs Quiz Questions updated in this page are prepared in the sense to help all aspirants to succeed in various Competitive Exams like UPSC IAS and other Civil Services Examination, Various Bank exams like IBPS PO, IBPS Clerk, SBI PO, SBI Clerk, RRB PO, RRB Assistant, Insurance exams like LIC AAO, UIIC Assistant, Railway Exams, Various Central Government Exams like SSC CGL, SSC CHSL, and more. Attempt all the Current Affairs Quiz Questions of 6th February 2019 and evaluate your score by matching your response with the correct answers mentioned at the end of this quiz questions section. By practising the FreshersLive Current Affairs Quiz Questions on a daily basis, you can surely succeed in the competitive exams as well as the interviews easily. Make use of this ultimate resource to the fullest and quickly achieve your goal!